Land F/X's Planting Design is organized for complete accuracy, flexibility, and detail control. From a small residence to an entire theme park, skip the tedious work, and focus on the art of design. Never count plants again! Rely on complete error checking and automatic quantities, all with an amazing graphic flexibility to express your design the way you want. Let the system take care of the counting, symbols, layers, and all the little details, allowing you to spend more time on the design process. 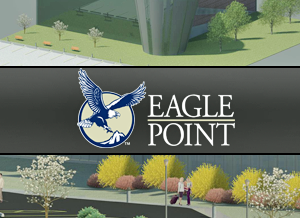 Eagle Point's LANDCADD, a comprehensive suite of landscape design and irrigation design software for AutoCAD® and AutoCAD® Civil 3D® allows you to produce professional planting, irrigation and site plans for residential and commercial properties. You have the ability to accurately count materials and equipment to produce cost estimates and place annotation callouts. 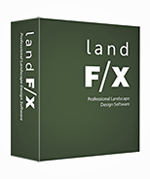 Land F/X is a software program specifically designed for Landscape Architects, Irrigation Designers and Planners that works seamlessly within AutoCAD®. 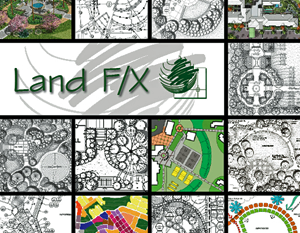 Land F/X was developed by a unique team of Landscape Architects, Irrigation Consultants, and top programmers over 15 years. Land F/X responds to the highest requirements and standards of the profession, and is always improving to meet the goals of this diverse discipline. Land F/X offers tools and automation that relate to every phase of a Landscape Architect's Services: Conceptual and Site Design; Planting Design and Documentation; Planting and Site 3-D Visualization: Irrigation Design and Water Management; Detail Creation; and Site Construction Graphics. Eagle Point's LANDCADD is a comprehensive suite of landscape design and irrigation design software for AutoCAD®, AutoCAD® Civil 3D® and Autodesk Revit®. LANDCADD offers Architects, Landscape Architects or Designers functionality to quickly and easily lay out site components as well as produce professional landscape, irrigation and site plans for residential and commercial properties. By accessing a wide-range of searchable plants, you are able to customize planting families and then use LANDCADD tools to locate trees, shrubs, flowers or ground covers. Plus, you can also layout hardscape features, calculate areas, obtain materials takeoff reports, and render the plan for presentations.